Carleton is in Northfield, just 40 miles south of the Twin Cities of Minneapolis and St. Paul. Often cited for its charm and livability, Northfield consistently ranks among the best college towns in the US. And the Twin Cities? They’re home to some of the best music, food, museums, and outdoor recreation in the country. The town of Northfield was established in 1856 by John W. North. Just 10 years later, Carleton College was founded, and we graduated our first students in 1874. Fast forward to today, and Northfield is a bustling river town with 20,000 residents, two colleges, and plenty to see and do. A short walk from campus, Northfield’s main street — Division Street — is lined with locally owned businesses, friendly coffee shops, and a variety of restaurants. Whether you’re looking for an authentic burrito, a newly released novel, or a funny postcard to send to your friends, you’ll find it in Northfield. You’ll also find several grocery stores, a clinic and hospital, and plenty of other amenities a short walk, bike trip, or bus ride away. Visiting in September? Don’t miss the Defeat of Jesse James Days. This annual celebration features a reenactment on horseback of the infamous James Gang’s failed attempt to hold up the Northfield Bank. The festival includes a parade and street fair that draws thousands of visitors. In December, check out Winter Walk. Students and “townies” pack Division Street for this candlelit winter celebration that includes horse-drawn sleigh rides, roasting chestnuts, and carol singers. On May 24, check out DylanFest at the Contented Cow Pub. Held on Bob Dylan’s birthday, this all-ages event celebrates one of Minnesota’s most notable musicians — and Nobel Laureate (that’s right!). You won’t go hungry here, that’s for sure. Whether you’re craving Southern barbecue, homemade soups and sandwiches, or spicy curries and naan, Northfield’s got you covered. Ask our Admissions staff members for their recommendations, and be sure to save room for a scoop of ice cream or a freshly baked cupcake for dessert. Insider tip: the locals can argue for hours over who has the best pizza in town — Basil’s or B & L. Try them both and let us know your favorite! Your understanding of Northfield won’t be complete without learning about Carleton’s Center for Community and Civic Engagement. The center connects students with organizations in Northfield and beyond, and facilitates meaningful volunteer experiences, paid positions, and academic or research projects. Our community engages deeply with business and nonprofit partners to tackle such issues as sustainability, educational access, and healthcare. Just 40 miles from campus, the Twin Cities of Minneapolis and St. Paul offer plenty of things for our students to do. 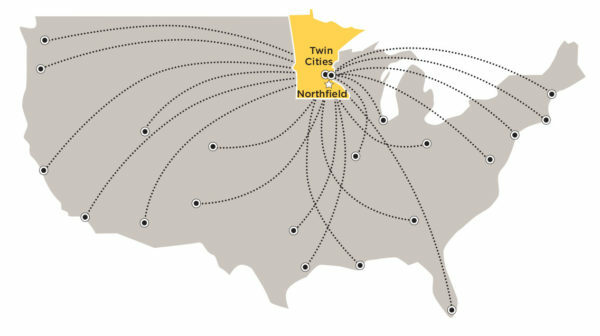 There are several ways to get there from Northfield, so most students find it easy and fun to visit the “Cities” several times a year. Here are a few things to do when you get there. The Twin Cities have an incredibly rich theater culture. Many locals claim that we have the second highest number of theater seats per capita. While that’s yet to be proven, there’s plenty of action on the marquees at the nationally known Guthrie, Ordway, Penumbra, and Orpheum theaters, but don’t overlook the critically acclaimed productions at smaller neighborhood venues like the Jungle, Mixed Blood, and Ritz theaters. Home to some of the most influential artists in rock, hip hop, pop, and jazz, the Twin Cities’ music scene is incredible. Whether you seek an intimate concert at the Cedar Cultural Center or want to catch a national headliner at First Ave, you’ll find a variety of great acts to satisfy your musical appetite. And speaking of appetites, you’ll find an amazing spread of restaurants, farmers markets, and food trucks throughout the metro area. You can enjoy authentic tamales, injera, pho, or lutefisk, so you’ll be able to indulge in old favorites, but be sure to try something new. Whatever you’re craving, if you’re looking for good food, Minneapolis and St. Paul have you covered. Did we mention that the largest mall in the United States is located just 30 minutes north of campus? It’s hard to ignore the Mall of America in Bloomington, Minnesota. It’s practically a rite of passage for Carleton students to trek to “MOA” to shop for clothes, stock up on sports team swag, ride a roller coaster, and play a game of mini golf — all under one roof. The Walker Art Center’s outdoor Sculpture Garden showcases a beautiful and sometimes silly collection of sculptures, such as the iconic Spoonbridge and Cherry. Just across town from the Walker, you’ll find one of the country’s most comprehensive collections of Asian art at Mia. Explore the fascinating history of electricity at The Bakken, or the history of Minneapolis’s mill culture at Mill City on the banks of the Mississippi River. And that’s just a small sample of the museums and galleries you’ll find throughout the Twin Cities. We’re really proud of our outdoor lifestyle. Parks, trails, and gorgeous scenery abound in this land of 10,000 lakes. You may have heard it gets cold in Minnesota, and it does, but we have four beautiful seasons here, which means we’re never at a loss for things to do outside. Depending on the weather, we can choose to bike, hike, skate, ski, swim, and run — and so we do! Experience the campus in real time. Visiting campus is the best way to discover if Carleton is the right fit for you. Wander around campus, talk to students and professors, sit in on classes, and attend an arts or sports event. Can't make it to campus? Explore the next best thing.